The Red Planet vehicle used by NASA astronaut Mark Watney (played by Matt Damon) in the upcoming film "The Martian." NASA's quest to put boots on Mars will be delayed significantly by a lack of cooperation from Congress, the author of "The Martian" believes. 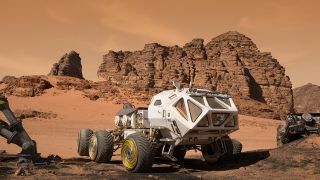 "NASA says they can do it by 2035, and I'm sure they could, given enough funding," Andy Weir, who wrote the book that has been made into a movie starring Matt Damon, said last week in a video interview with Space.com's Dave Brody at NASA's Jet Propulsion Laboratory in Pasadena, California. "But I don't have faith in Congress to give them enough money to make that happen, so I'm being a little more conservative — going [with] 2050," Weir added. In "The Martian," NASA astronaut Mark Watney (played in the film by Damon) gets separated from his fellow Red Planet explorers during a storm and is presumed dead. Watney must use his wits and engineering skills to stay alive by himself on Mars (his crewmates evacuated) and get in touch with mission control back on Earth. Weir said he's thrilled with Damon's performance in the film, which comes out Oct. 2. "He absolutely nails the character; he does perfectly," Weir said. "He's exactly how I imagined Watney. I'm really, really happy." Weir also said he's a big proponent of real-life space settlement, though he's not solely focused on Mars as a destination. "I think it's important that humans establish a self-sufficient human population somewhere other than Earth. So, it could be the moon, it could be Mars, it could be whatever; it could just be in solar orbit," he told Brody. "That way, it brings our chances of extinction down to basically zero." The same basic reasoning, incidentally, drove Elon Musk to found SpaceX back in 2002. Musk has said the company's primary motivation is to help make humanity a multiplanet species, and the billionaire entrepreneur envisions SpaceX ferrying tens of thousands of people to the Red Planet in the coming decades. Weir said he thinks SpaceX and other private companies will be important players in the first manned mission to the Red Planet's surface, but only as part of an international effort led by NASA and other government agencies. "Everyone will play a part, but I don't think private industry could possibly beat governments there," Weir said.